Would you have expected Singaporeans to generate a total of 791,000 tonnes food waste? That’s almost equivalent to 108 full load double-decker buses! Despite being a little red dot, we are guilty of contributing to high level of food wastage with 77% of Singaporeans regularly waste food at home. Over the past 10 years, food wastage has increased by about 40%. On the other spectrum, 1 in 10 Singaporeans is food insecure which creates a gap in food distribution. Foodbank Singapore, a registered charity, aims to bridge the gap in the market by collecting surplus food in the market and providing it to organisations and people in need of food. 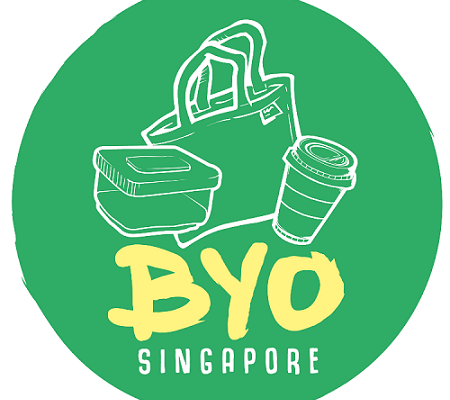 We had an interview with Foodbank Singapore’s Co-founder, Nichol Ng. TSP: What inspired you to start Foodbank? 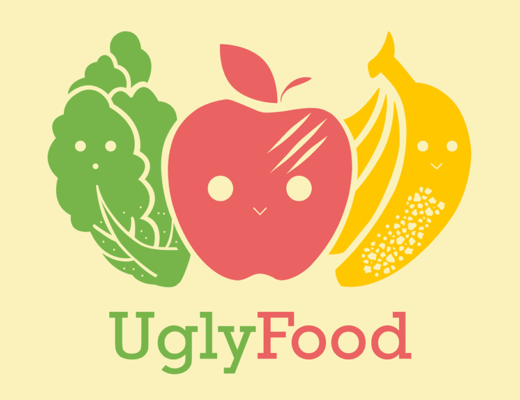 As our co-founders are in the food business, we realised that a lot of surplus food was being thrown away because suppliers/wholesalers did not have an avenue to donate them. At the same time, we felt that we should not be throwing any surplus food away when there are still people in need of food. This was when our co-founders decided to start The Food Bank Singapore to try and bridge this gap. Watch this video to find out more! TSP: Can you tell us a few challenges you faced when carrying out activities for Foodbank? In the past year, we have faced an influx of donations and manpower was starting to be a problem. Besides hiring more people, we also tried to engage our volunteers even more and incorporated technology to ease the burdens off our team. One major challenge we have been facing since the start is the lack of donations from supermarkets, even though we are finally starting to work with one major supermarket chain. We hope that companies are more open to donating their surplus food and not just conveniently dump them away. TSP: Since the launch of Foodbank, what is the general response from the public? The public has slowly warmed up to the idea of the food bank since we spend a lot of time on advocacy work and building up a stronger volunteer pool. Food companies and businesses have also strengthened their support quite a fair bit since 2012. Although no one has yet to take a firm stand of donating all their excess, at least more companies are open to the idea. Having said that, we are far from what we should be doing. TSP: Can you share with us a few statistics on the impact of Foodbank over the years? TSP: For those who are interested in getting involved with Foodbank, can you share 2 to 3 quick and easy steps to get started? 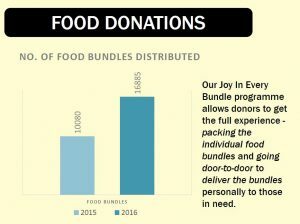 You can find out more about getting involved at http://www.foodbank.sg/index.php/get-involved. TSP: What do you think should be done by the government to combat the issue of food wastage? Along with incentives for other forms of recycling, they should really be looking at incentives to encourage recycling. Another way is to penalise for people who throw or incinerate. In general, recycling has to make commercial sense to businesses as well. They need to start realising that food is also a precious commodity we have learnt to take for granted but have not accorded as much respect and attention like water, paper and plastic. TSP: What are some of your future plans for the Foodbank? In 2018, we plan to engage even more food companies and corporates. At the grassroots level, we plan to do more advocacy as well. 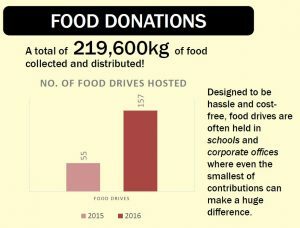 For more on our activities, check out http://www.foodbank.sg/index.php/programmes-events.